The Boeing Model 247 was an early United States airliner, considered the first such aircraft to fully incorporate advances such as all-metal (anodized aluminum) semi-monocoque construction, a fully cantilevered wing and retractable landing gear. Other advanced features included control surface trim tabs, an autopilot and deicing boots for the wings and tailplane. "Ordered off the drawing board", the 247 first flew on February 8, 1933 and entered service later that year. 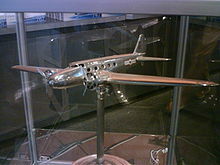 Subsequently, development in airliner design saw engines and airframes becoming larger, and four-engine designs emerged, but no significant changes to this basic formula appeared until cabin pressurization and high altitude flight were introduced in the early 1940s with the first pressurized airliner, the 307 Stratoliner. Boeing had eclipsed other aviation manufacturers by introducing a host of aerodynamic and technical features into a commercial airliner. This advanced design which was a progression from earlier Monomail (Models 200, 221, 221A) and B-9 bomber designs, combined speed and safety. The Boeing 247 was faster than the U.S. premier fighter aircraft of its day, the Boeing P-12, which was an open-cockpit biplane. Yet its flight envelope included a rather docile 62 mph landing speed which precluded the need for flaps, and pilots learned that at speeds as low as 10 mph, the 247 could be taxiied "tail high" for ease of ground handling. In addition, the 247 was the first twin-engine passenger transport able to fly on one engine. With controllable pitch propellers (standard equipment on the 247D), the 247 could maintain 11,500 ft at maximum gross takeoff weight. Its combination of features set the standard for the Douglas DC-1 and other airliners before World War II. Originally planned as a 14-passenger airliner powered by Pratt & Whitney R-1690 Hornet radial engines, the preliminary review of the design concept by United Air Lines' pilots had resulted in a re-design to a smaller, less capable design configuration. Nonetheless, the 247 was a remarkable achievement and was the company's showcase exhibit at the 1933 Chicago World's Fair. The cockpit windshield of the first 247s was angled "forward" instead of the conventional aft sweep. This was the design solution (similar to that adopted by other contemporary aircraft that used a forward raked windscreen) to the problem of lighted control panel instruments reflecting off the windshield at night, but it turned out that the forward-sloping windshield would reflect ground lights instead, especially during landings, and it also increased drag slightly. By the introduction of the 247D, the windshield was sloped aft in the usual way, and the night-glare problem was resolved by installing an extension (the glarescreen) over the control panel. Boeing considered safety features highly, building in structural strength as well as incorporating design elements that enhanced customer comfort and well-being, such as the thermostatically-controlled, air conditioned and sound-proof cabin. The crew included a pilot and co-pilot as well as a flight attendant who could tend after passenger needs. The main landing gear did not fully retract; a portion of the wheels extended below the nacelles, typical of designs of the time, as a means of reducing structural damage in a wheels-up landing. The tailwheel was not retractable. While the Model 247 and 247A had speed-ring engine cowlings and fixed-pitch propellers, the Model 247D incorporated NACA cowlings and variable pitch propellers. Picture - Boeing 247D in its MacRobertson Race markings, c. 1934. Note the inaccurate race number and dramatic pose in this fanciful 1935 illustrated card art. As the 247 emerged from its test and development phase, the company further showcased its capabilities by entering a long-distance air race in 1934, the MacRobertson Race from England to Australia. During the 1930s, aircraft designs were often proven in air races and other aerial contests. A modified 247D was entered, flown by Col.Roscoe Turner and Clyde Pangborn. The 247, race number "57," was essentially a production model but all airliner furnishings were deleted to accommodate additional fuselage fuel tanks (eight in total). The MacRobertson Race attracted aircraft entries from all over the globe including prototypes as well as established production types with the grueling course considered an excellent proving ground as well as an opportunity to gain worldwide attention. Turner and Pangborn came in second place in the transport section (and third overall), behind the Boeing 247's eventual rival, the new Douglas DC-2. Winner of the 1934 US Collier Trophy for excellence in aviation design, the first 247 production orders were earmarked for William Boeing's airline Boeing Air Transport. The 247 was capable of crossing the United States from east to west eight hours faster than their predecessors, such as the Ford Trimotor and Curtiss Condor. Entering service on May 22, 1933, a Boeing Air Transport 247D set a cross-country record pace of 19� hours on its San Francisco to New York inaugural flight. Due to the initial demand from U.S. air carriers, Boeing sold the first 60 247s, an unprecedented $3.5 million order to its affiliated airline, Boeing Air Transport (part of the United Aircraft and Transport Corporation, UATC), at a unit price of $65,000. TWA (Transcontinental & Western Air) also ordered the 247 but UATC declined the order, which resulted in TWA President Jack Frye setting out the requirements for a new airliner and funding Don Douglas to design and build the Douglas DC-1 prototype. 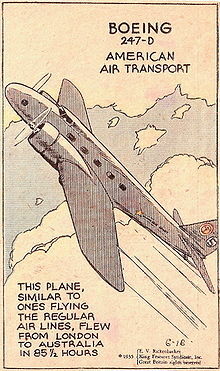 Douglas eventually developed the design into the historic and enormously successful DC-3 line. Although the Boeing design had been the first to enter series production, the 247 proved to have some serious design deficiencies. Air carriers considered its limited capacity a drawback since it only carried 10 passengers, in five rows with a seat on each side of the aisle, as well as a flight attendant. Compared to the more capacious DC-2 and later DC-3, the passenger count was too few to make it a commercially viable airliner. Another feature influencing passenger comfort was that the 247's main wing spar ran through the cabin area, so persons moving through the cabin had to make a large step over it. The Lockheed Model 10 Electra had a similar configuration and while it was a more compact design, the Electra managed to carry the same number of passengers at a slightly better overall performance, and more importantly, at a lower cost-per-mile. Seventy-five 247s were built; by contrast, Douglas collected 800 civil orders for DC-3s before the Pearl Harbor attack, and produced over 10,000 DC-3s, including wartime production of C-47; while the rival Lockheed Electra "family" was eventually to reach over 3,000 in its various civilian and military variants. Boeing Air Transport bought 60 examples, United Aircraft Corp. (10), four went to Lufthansa, and one a private owner in China. While the industry primarily standardized on Boeing's competitors, many of United's aircraft were later purchased by Western Air Express at "bargain basement prices". The 247 remained in airline service until World War II, when several were converted into C-73 transports and trainers. No. 121 Squadron, Royal Canadian Air Force (RCAF) operated seven Model 247Ds as medium transports during the early part of the war. Some 247s were still flying in the late 1960s, converted either into cargo transports or personal business aircraft. A number of specially modified variants included a Boeing 247Y appropriated from United for Air Corps use as a test aircraft fitted with two machine guns in the nose. The same installation later was fitted to a 247Y owned by Generalissimo Chiang Kai-Shek; this aircraft also featured a Colt .50 caliber machine gun in a flexible mount. A 247D purchased by the British Royal Air Force became a test mule for new equipment, featuring a nonstandard nose, new powerplants and non-retracting gear. The Turner/Pangborn 247D still exists. Originally flown on September 5, 1934, it was leased from United Airlines for the 1934 MacRobertson Race and returned to United where it served in regular airline service until 1937. Subsequently, the 247D was sold to the Union Electric Company of St. Louis for use as an executive transport. The Air Safety Board purchased the aircraft in 1939 and it remained in use for 14 years before it was donated to the National Air and Space Museum, Washington, DC. It is displayed today with two sets of markings, the left side is marked as NR257Y, in Colonel Turner's 1934 MacRobertson Race colors, while the right side is painted in United Airlines livery, as NC13369. October 10, 1933 - A United Air Lines 247 was the victim of the first proven case of sabotage of a commercial airliner. The aircraft, en route from Cleveland to Chicago, was destroyed by a nitroglycerin-based explosive device over Chesterton, Indiana. October 7, 1935 - United Airlines Boeing 247 went down about 10 miles west of Cheyenne. Cause unknown: three crew and nine passengers killed, there were no survivors. December 15, 1936 - Seven died when a Western Air Express 247D (NC-13370), en route from Burbank, California to Salt Lake City via Las Vegas, crashed just below Hardy Ridge on Lone Peak in Utah. The major parts of the aircraft were hurled over the ridge and fell over a thousand feet into a basin below. January 12, 1937 - Western Air Express Flight 7, a 247 flight from Salt Lake City to Burbank, crashed into a mountain near Newhall, California, killing five. Among the dead was Martin Johnson of Martin and Osa Johnson fame (adventurers, authors, and documentary filmmakers). Powered by new 625 hp P&amp;W Wasp, on special order for Deutsch Luft-Hansa in 1934. Original one-off was a race aircraft designed for the McRobertson Race; use of Hamilton Standard variable-pitch propellers allowed for a seven mph gain; the 247D configuration incorporated in production series bearing the same name. Armed version, one exported to China, second used for trials. Designation for Boeing 247D airliners "drafted" into military service in USAAF, 27 in total. Private owner operated one aircraft. Boeing Air Transport (later United Air Lines) operated 60 aircraft. United Aircraft Corporation operated 10 aircraft. Western Airlines received some of ex-United Aircraft Corporation aircraft. Picture - Boeing 247D at the National Air and Space Museum showing United Air Lines markings in this view. c/n 1699, CF-JRQ Exhibited in Canada Aviation Museum, Ottawa. Donated to the museum in 1967 by California Standard Oil of Calgary, Alberta. c/n 1729, N13347 Still airworthy, exhibited in the Museum of Flight Restoration Center, Paine Field, Snohomish County, Washington, USA. c/n 1953, NC13369 / NR257Y Exhibited in the Hall of Air Transportation at the National Air and Space Museum, Washington, DC, USA, with United Air Lines colors and registration as NC13369 on its right fuselage and wing and as NR257Y with MacRobertson Race markings on its left side. Pedigree of Champions: Boeing Since 1916, Third Edition. Seattle, WA: The Boeing Company, 1969. No ISBN. WorldCat. Serling, Robert J. Legend & Legacy: The Story of Boeing and its People. New York: St. Martin's Press, 1992. ISBN 0-31205-890-X. van der Linden, F. Robert. The Boeing 247: The First Modern Airliner. Seattle, WA: University of Washington Press, 1991. ISBN 0-295-97094-4. Retrieved: July 26, 2009. Yenne, Bill. Boeing: Planemaker to the World. New York, Crescent Books, 1989. ISBN 0-517-69244-9.